The world once lived in ignorance of preternatural creatures, until the day Riley O’Rourke and her vampire friend and mentor, Onyx, changed the world. Now that everyone knows of the existence of preternatural creatures, these creatures live fully integrated into society. Some of the preternaturals, however, are not happy about humans knowing they exist. The Queen of the Winter Fae is irate about her world being exposed and is sending nightmare creatures after Riley. Seeing no other option, Riley must rely on the help of the Summer Fae Queen, but her help comes with a price. Now Riley must steal a valuable mirror from Winter as her payment to Summer, but the act might just endanger the whole world. 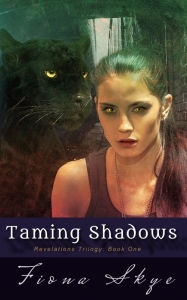 Taming Shadows by Fiona Skye is an exciting urban fantasy full of some of my favorite creatures and is served with a side of sizzling romance. Riley is a strong female character, but I love that she still has personal demons to slay to make her even stronger. David is a fantastic character with just the right mix of sweet and strong. All of the characters are well written, and the minor characters, such as Aine and Orla, are every bit as enjoyable as the main characters. Some of the fantasy creatures were not what I was expecting, while others were exactly what I expected, and that made the story even more enjoyable to me because of the mix of new elements with the familiar. As a cool bonus, Skye has included a bunch of Riley’s food recipes in the back. I’m pretty excited to try some of them! This story has action, romance, and most importantly, otherworldly creatures, which makes this book a must-read. I’m looking forward to reading the next book, Silver Shackles. Fiona Skye wants to live in a world where that bartender is actually a vampire and one runs the risk of waking up in another universe every morning. As an author, her books have been ranked in the top twenty Urban Fantasy and Fantasy Romance charts on Amazon and have received stellar reviews from readers around the globe. When she’s not writing, you can find her indulging in her love of crochet, playing with her children and her dog, or searching for the perfect plate of cheese and onion enchiladas. Her latest book, Perchance To Dream, hits the shelves in the summer of 2016, and the final book in the Revelations Trilogy will be released in the autumn of 2016. Find out more about Fiona and her books at http://www.fiona-skye.com.